Hard water is extremely dangerous. First of all, hard water is formed when water is ‘filtered’ through deposits of chalk and limestone and is insanely high in mineral content – mostly calcium and magnesium carbonates. Secondly, it can cause mild health problems when ingested on a regular basis. Thirdly, it is absolutely devastating to your water-using fixtures and appliances, like pipes, boilers, water heaters, washing machines and dishwashers. And lastly, it is common – more than 85% of the U.S. has hard water. If you don’t take action TODAY and prevent the appearance and development of hard water, you risk having to pay for costly San Diego water damage restoration. Also, you might have to have flood repair work done, should the damage escalate. Leading San Diego water damage restoration experts give you step-by-step instructions on how to spot early signs of hard water and curb them. You will not only avoid straining your finances, but more importantly – you will keep your family and property clean, safe and healthy. 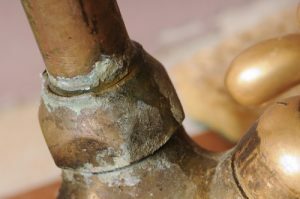 The development of hard water in the pipes leads to limescale buildup, which further causes pipes to corrode, clog, leak and ultimately burst. A slow water pressure from any fixture (showerhead, faucet) is a clear indication of a limescale-induced clog or pipe leak. Since you cannot examine the pipes yourself, an easy way to check if there is hard water in the pipes is to run an in-home hard water test – pour water into a bottle (make it one-third full) and add a dye-, detergent- and perfume-free soap. If the water is cloudy and there aren’t many bubbles, you have hard water in your pipes. You can also purchase a hard water test kit it for $5 – $20. An alternative is to use a combination of vinegar and baking soda for draining your pipes once a month. If you notice white film (a.k.a. soap and limescale buildup) on your dishes, especially glasses, hard water minerals are eating away your dishes. Now, this situation may not cause water damage directly, but you will have to load your dishwasher again and again until the dishes are clean, or – more likely – clean the dishes yourself, which means – running excess water. In combination with low water pressure caused by the buildup in the pipes, you see this is not exactly the dream scenario. Always put dishwasher salt in your dishwasher. An eco-friendly product you can buy is LemiShine, a natural citrus-based softening powder. If you really want to go DIY style, you can simply put a half cup of almighty baking soda in for each dish load. You can always purchase a dishwasher with a built-in water softener. If you see white film or spots on your clothes after washing, and your clothes feel rough, limescale is building up in your washing machine. Clean the soap drawer with a stiff brush you use for washing the dishes, and also clean the soap dispenser with a brush and a good bleach. You only need to do it once or twice a month. Try to use washing powders rather than liquid detergents, because powders contain ‘builders’ that remove limescale. If white film is already visible inside the machine, soak the affected surfaces in lime juice and leave it on for an hour to work. 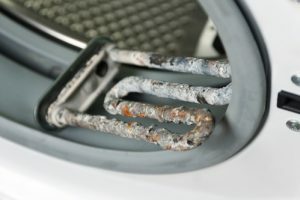 Tell-tale signs of hard water in a water heater are a puddle of water under the heater, slow leak and corroded fittings. If you are lucky, you will spot the problem even earlier – if you feel your skin is rough and slightly itchy after taking a shower (provided you didn’t use an aggressive skin care product), the water might be laced with calcium and magnesium carbonates. Apart from installing a water softener, there are some rather common-sense tips: drain your heater annually and turn it off when you are away for a longer time – the more water there is, the more likely it is to develop limescale. The best option would be to buy a tankless water heater – it is definitely more efficient than conventional ones and it has a longer lifespan, which compensates for its hefty price. For more information on how to prevent water damage and what to do if you need San Diego water damage restoration done professionally and at short notice, contact KIC Restoration at 866-265-5245 (Toll-Free) – you can reach our technicians 24/7!